I still had some mangos left and I was not done experimenting with cardamom. A while ago I tried making a rice pudding for the first time and I really enjoyed it. I was thinking that this time a coconut and mango rice pudding would be nice. The last rice pudding that I made was flavoured with vanilla and cinnamon and I though that cardamom would work well with the mango and coconut. Working with the cardamom was kind of fun. For ground cardamom you have to bash the pod to open it and scrap the seeds out before you can go at them with a mortar and pestle. At first I was going to just mix the pureed mango into the rice pudding but then I thought that it might look nice if you could see the white coconut rice pudding and the mango puree through the glass. I also had a few macadamia nuts left so they went on top. Making rice pudding takes a bit of time but if you have a rice cooker with a porridge setting it is as easy as start it and forget it until it beeps. I really enjoyed the cardamom and coconut rice pudding with mango puree. It was a nice cool treat. I have also been liking the cardamom though it can be a bit strong so I will have to watch how much I use so as not to overpower the dish that it is in. Place the coconut milk, rice, salt, sugar and cardamom in a sauce pan and bring to a boil. Reduce the heat and simmer for 25-35 minutes stirring occasionally. Mix in the mango and garnish with chopped macadamia nuts. Take a look at the Think Spice: Think Cardamom Event at Simple Indian Food. oh man! i was just busy being amazed at how you blog substantially EVERY SINGLE DAY, and then i refreshed your home page and there was a new entry. i’m a self-taught cook too, trying to learn the ways of the kitchen. however i lucked out in the apartment hunt and got a huge kitchen. all the more kudos to you and your closet of wonders. this makes me want to focus more seriously on recording my food adventures. i am in awe of your dedication. I love that glass bowl. Great job on this dessert – it looks amazing. I don’t normally go for rice pudding, but this looks really good. Do you actually EAT all this stuff? You look so trim. I don’t know how you do it! Coconut rice and mangoes go together so nicely. I’m wondering, the first step says “Place the coconut milk, milk,” in … does this recipe include other milk not in the ingredients or is that just a typo? I’m thinking I will try it this weekend. I have to buy some when I get back home. That looks so ridiculously gorgeous, I love the orange of the mango against the white of the rice. Cardamom is such a gorgeous spice, and yes, quite fun to bash up in the old pestle and mortar. Kelvin, how could you do it… again… so good, so creative! Amongst all your mango’s creation this one is my most favorite. How cool is that!!! I agree with the first comment. You are a fantastically dedicated cook Kevin! I wouldn’t have even thought of using coconut milk in rice pudding. Great looking dessert! you keep coming up with mango dishes! this is one of my thai favourites. i can’t take this anymore. Kevin, the colour is brilliant and this is a great addition to your Magical Mystical Mango tour! This is too good to be true Kevin. I know this will not only take me into food heaven but my son will hug me for this recipe. I’m sending you one of those hugs for sharing this. YUM! This is one of my favorite flavor combinations. My favorite dessert is sweet sticky rice with mangoes! Mmmm. That looks really nice! Love the texture contrast. Another great mango recipe. 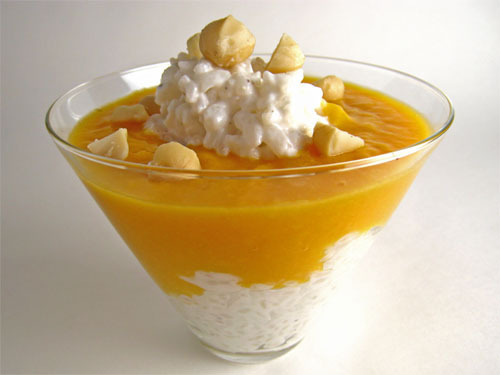 Great indian dessert…again love the combo of mango, cardamon and the coconut. this looks great!! would you believe that, at first glance on taste spotting, i thought those nuts were chickpeas!? (I actually think that would be really good too!) haha great job this looks awesome! It looks amazing! I wish I could grab a spoonful through the monitor! Kevin this could not be any more beautiful. You should get a job as a food stylist. It sounds yummy too. This sounds awesome. I love mango anything. And it’s so pretty, too! You really are becoming the master of mango, and cardamom too. Time for me to replenish my mango supply. Mango is my number one fruit. I love it. This is an excellent recipe and superb presentation. Very creative and inviting! Okay, that’s it… Kevin, you MUST come out with a cookbook dedicated to mango-containing recipes – everything you’ve been posting has been positively brilliant!! Mango is my all time favorite fruit. This dessert looks amazing!!! Kitt: Sorry about that, it was a typo. I just used the coconut milk though you could easily use a combination of milk and coconut milk. Kevin, that is absolutely gorgeous! Hmmm… I have all of those ingredients in my pantry. I’ll have to try it – looks delish! You seriously amaze me every time I visit your blog! You are so talented…I can’t believe you don’t do this for a living. Wow! This looks delicious! I´m very tempted to try this at some point…great photo too! That’s a very summery looking presentation of the rice pudding. It looks fantastic. I made rice pudding recently, too, but cooked it in the risotto style (e.g. mix in a little, stir til absorbed, mix in a little, repeat until your arm is about to fall off). I don’t think all the extra effort I put into it was worth it though–this looks like a much more reasonable about of work. Fabulous photo Kevin – makes me want to eat it right now! Great looking dessert! I love rice pudding, and this mango addition sounds perfect! Kevin, This looks absolutely scrumptious!! Perfection in glass! oh and i agree w/tina, i am amazed at how often you are able to update your blog! Came here thro’ the cardamom round-up. That is such a visual treat. Love the presentation! Gorgeous picture! You definitely were right to layer the mango and rice pudding: the contrast is lovely. I have a recipe for rice pudding where you melt the sugar and spices in a little bit of butter before adding the rice and toasting it, and then cooking it risotto-style. It takes a little bit more effort, but I love the creamy texture. This looks so good!!! yum yum! What an inspiration!! Mmm this looked so good I had to try it! I gave it a whirl and posted my results here–maybe you’ve got a few tips for me? Thanks for sharing your creations with us, they’re amazing! fabulous! you make me want to make it this right this minute! You posted another awesome recipe, Kevin!! Delicious! Looks great but is that supposed to be 1 & 1/4 cups of arborio? 1/4 cup doesn't seem right….? Anonymous: This recipe is for 2 small dessert sized portions and thus only uses 1/4 cup of the rice. It can easily be doubled or quadrupled though. Just made this using a rice cooker. Delicious and SERIOUSLY easy.